Sweet, luscious, juicy, tree-ripened peaches! You can enjoy a taste of summer and a fresh Georgia peach all year round with Logic Smoke Peach flavored electronic cigarette e-liquid. The aroma alone will set your mind into warm, breezy summer days. And the flavor is out of this world. 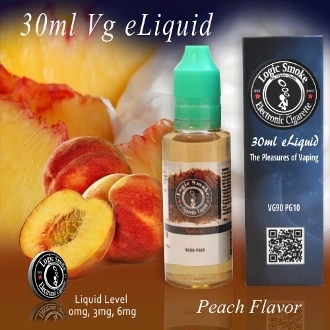 Logic Smoke Peach e-liquid is top-notch all by itself but can enhance any of our other Logic Smoke fruit flavors available for use with your MOD unit. Create your own luscious dessert by mixing with our Cheesecake or our buttery Waffle flavored e-liquid for a slice of peach pie. The flavor combinations are endless with this winning flavor!